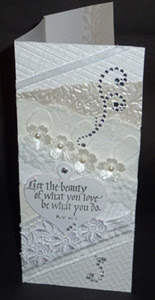 Well there was another challenge using white on white, but this one didn't allow any other color... and then there was Flourishes challenge of a tri-fold card and the rest evolved again, glitter rhinestones, half pearls etc.. I'm using a Quietfire Design quote stamp on the front. To see lots more details and pics, click on card image and enjoy. Such a pretty card Yogi! Happy New Year! Lovely card, love the sentiment. Thanks for sharing with us in our WOW challenge at Die Cut Dreams this time. Beautiful card, so many lovely elements. Thanks for sharing at MTTC this week. Great card, I love all the white-on-white details. Thanks for joining the Anything Goes Challenge at Top Tip Tuesday. Oh what a lovely creation, Thanx for joining us at Incy Wincy Designs. And good luck. Lovely card, Yogi. The textures and layers are marvelous. Happy New Year Yogi! Your white on white fold card is simply BEAUTIFUL!!! I bet it's sparkles even more IRL!! !